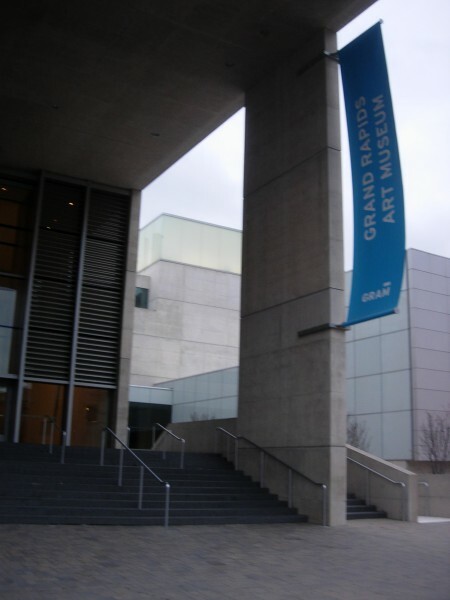 The Grand Rapids Art Museum education center offers many programs to engage audiences in the arts and encourage life-long learning. When visitors to the Grand Rapids Art Museum walk in the building, they are immediately greeted with elegant architecture and works of art. As visitors look around, to the right they see a hallway across the courtyard which ends with a bright yellow door. This hallway leads to the education center, a place where the Grand Rapids Art Museum (GRAM) aims to give people access to a quality education of the arts at any stage of life. Jon Carfagno, the education director at GRAM, said that the mission of the museum is to inspire discovery, enjoyment and learning about art, to serve as a cultural resource and to collect quality works of art. “The education center aims to fulfill the mission by creating programs and materials that inspire a lifetime of learning through the arts,” Carfagno said. The education center fulfills GRAM's mission by distinguishing three core programming areas to develop when creating programs and planning events. Each program is aimed at a certain audience. These program areas are youth and family, adult and school programs. “This structure was designed to sustain our current strengths, while continually diversifying the experiences and offerings that are available to our guests,” Carfagno explained. One set of education center programs that has received much recognition are the school programs. This year GRAM was awarded a $10,000 grant for education from the National Endowment of the Arts for GRAM's "Language Artists: Creature Connections" program for third graders. “We are proud to say that we see every third grade student in the Grand Rapids Public Schools,” Carfagno said with a smile. School programs coordinator Christopher Bruce works with the schools’ curriculum planners in order to set up a program geared toward helping students pass the Michigan Educational Assessment Program (MEAPS), a standardized test in Michigan. The third graders then come into the museum and work collaboratively on a project and later have the opportunity to return as fourth graders for follow-up experiences. The museum also offers many programs for youth and families. Every Saturday the museum hosts “Saturday All Day with the Arts,” where families can come and participate in hands-on art-making activities. This program offers activities for all ages: younger siblings, older siblings and parents. Each month there is a new theme that corresponds to either a permanent collection or one of the special exhibitions. Carfagno said that using different themes helps the activities remain interesting for regular audiences. The youth and family programing area also offers summer camps and camps during spring and winter break for K-12 students. A new installment to the program is birthday parties where the museum hosts birthday parties for children ages 5-12. GRAM's education center is also very active in community outreach. In order to do this, GRAM collaborates with other local organizations to impact the community. One way they do community outreach is to set up booths at community events. For example, the education center will set up a table at the Grand Rapids Symphony on Dec. 8, which will contain hands-on activities and information about upcoming events. In addition, Jan. 12 and 13 they will partner with the Grand Rapids Griffins’ Great Skate held at Rosa Parks Circle. They will set up booths at this event as well. GRAM also works with ArtPrize to make the event more interactive. During the week of ArtPrize, the education center sponsors a collaboration transformation event. This year 882 K-12 studentss participated in a multi-sensory collaborative learning experience in which students watched a video about an artist and then collaboratively created an art piece inspired by that artist. “Each student contributed a small section to a larger work of art,”Carfagno said. The exhibit showing the final product of the students' work can be viewed in the museum for a limited time. GRAM also tries to systematically and strategically develop the program areas. The education center staff thought that the youth and family program was becoming established, so they moved to developing the studio adult programs, Carfagno said. In an effort to expand the adult programs, the education center launched a brand new program called “Creativity Uncorked.” This program was initially launched for the Real/Surreal temporary exhibit which is at the museum until January. "Creativity Uncorked" is a 21+ event where adults come to sip wine while discussing art. “[Adults] come as individuals and share ideas with someone they haven’t met before,” Carfagno said. The discussions encourage the idea that a museum is a forum for people to come and share thoughts with each other, Carfagno said. Each participant brings something different to enrich the experience. The education center also has an established docent program where educated volunteers lead tours and discussions for the public. This program serves multiple audiences in multiple programs. Carfagno expressed what an important and unique part of the museum the docents are. They come from all different backgrounds, which enables them to offer various unique perspectives. “They are the largest supporters of learning,” Carfagno said. Carfagno believes that GRAM's audience-centered programs give visitors an engaging, interactive experience. “[GRAM] provides a variety of platforms, access points and experiences to meet the needs of a 21st century audience,” he said.